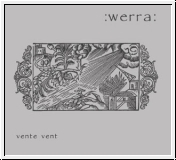 Fresh air will be blown into the neofolk scene by :werra: and their new album „vente vent”. Six years after the release of the debut “MMI-MMV” the musicians return with their new album and thirteen tacks which are combined by the recurring motive of the change bringing wind. Catchy melodies, driving tunes und dreamy songs alternate while poems and own lyrics follow the tradition of their previous work. Musically the trio sets a new course with the addition of an accordion that brings a new dimension and depth to the songs without losing :werras: very own value of recognition. “vente vent” will be released in three different formats as CD, CD box (mailorder only) and on colored vinyl. The first 100 copies of the vinyl will contain the CD as well. Diesen Artikel haben wir am Montag, 04. Dezember 2017 in unseren Katalog aufgenommen.